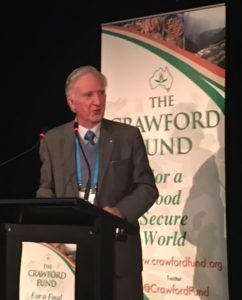 Our chief executive, Dr Denis Blight AO FRSA, recently contributed an article entitled ‘The Commonwealth and Global Food Security’ to the Commonwealth Voices September issue. Under the section of Commonwealth Concern, Denis emphasises that there are multiple pathways to global food security. “Amongst an array of solutions, three show promise: new technologies, enhanced trade through biosecurity, and reduction in food losses and waste” said Denis. The latter issue of food loss and waste was the focus of our recent Annual Crawford Fund Conference ‘Waste Not, Want Not: The Circular Economy to Food Security’. Denis goes on to say that food security is a priority issue for all sectors in the Commonwealth. You can access Denis’ article here, and the latest Commonwealth Voices issue at this web link.